Be your own designer with Makr -- named “Best of 2014” by Apple, Makr is a universal creativity app that for designing + printing custom goods. Now powered by Staples, Makr makes custom designing and personal branding easier, faster and more fun than ever. Makr brings the power of great design and branding to your fingertips. Perfect branding and spirit swag for your business, wedding, group or special event, Makr’s print shop can help you create it all. Express yourself with custom logos, shirts, cards or even a temporary tattoos. "The mobile design studio of your dreams" – Brit + Co.
- Customize: High-level customization makes it easier for you to make your ideas come to life. 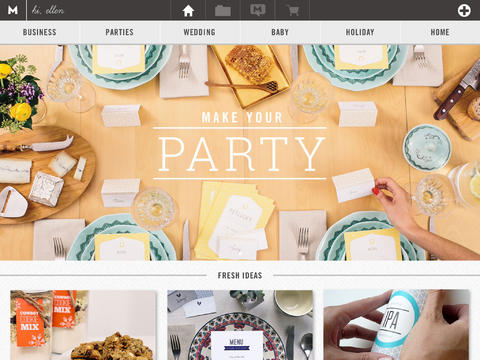 - Templates: Logo templates for business, weddings, personal branding and just for fun. Want to make a fashion statement with a custom t-shirt? Make it happen with Makr. - Upload: Import your own custom art and put them on any of your Makr projects or design templates. - Export: Export custom logos as hi-res transparent PNG files of your personalized logos. Even purchase and export a PNG of your logo for the future. - Templates: Choose templates for different events and change the icons, fonts and colors. - Print: Print and ship anything you want straight to your door or to Staples. - Design: Create your very own professionally printed custom t-shirts, tote bags and temporary tattoos! - Order: Order your very own professionally printed paper products and kits. 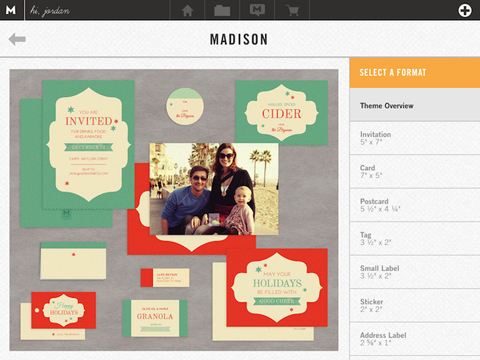 - Purchase: Hi-res project PDFs (including Avery-compatible templates) for printing high-quality designs at home. - Inspire: Get access to original blog content for limitless creative inspiration. - Share: Let your friends see your designs! Share your work via Email, Facebook, Pinterest and Twitter. Download Makr today and be your own designer.